Blink-182 have revealed in a new interview with MTV that they are planning to start demoing new music for their new album late this year and being in the recording studio early next year. "These shows we've been playing are business meetings," Tom DeLonge laughed. "We're thinking of being great, so we called some business meetings. This is the easiest way to do it." "When we're off tour, or when we're not working directly together, because we live so far apart, we usually talk through text messages or emails; the work starts when the three of us get into the room, and this tour is about that," Mark Hoppus added. "Just getting back into the routine of playing music, and seeing one another, meeting with labels when we're here in New York. 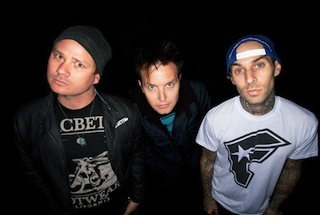 Right now, we're just planning the next 18 months of Blink-182." Those 18 months will almost certainly see new music from Blink — Hoppus said the tentative plan is "demoing late this year, being in the studio early next year" — though, after self-releasing their Dogs Eating Dogs EP in late 2012, they're thinking of once again teaming with a label for the follow-up ... on their terms, of course."